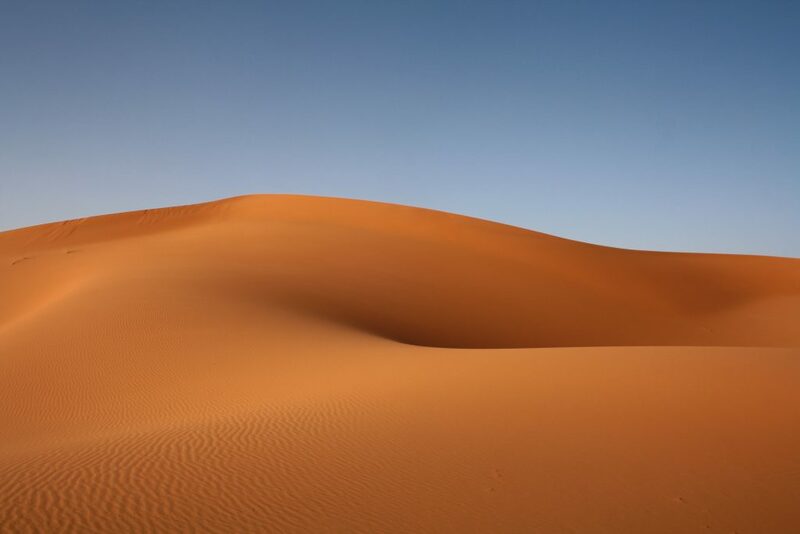 An area that is 16 percent larger than the contiguous United States, the Sahara Desert is the largest hot desert on planet earth. The Arabic word “Sahara” literally translates to “the Great Desert” and it truly is as it stretches over 3.5 million square miles (9.2 million sq km) across northern Africa. The desert region is incorporated into the territories of 11 African nations, each with its unique historical ties to the desert ocean. Despite its immense size and relatively close proximity to major global cities, it is not an easy place to get to. 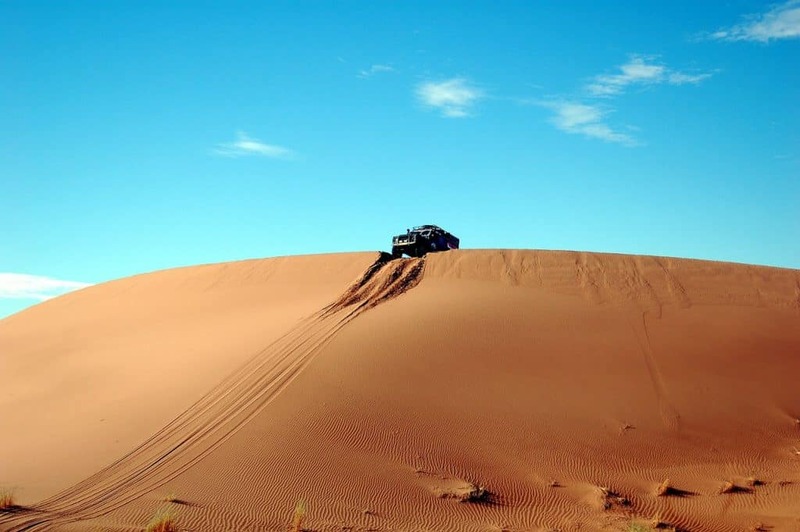 Multi-day Morrocco desert tours are your best option if you want to visit these majestic sand dunes and see one of the most awe-inspiring regions on the planet. 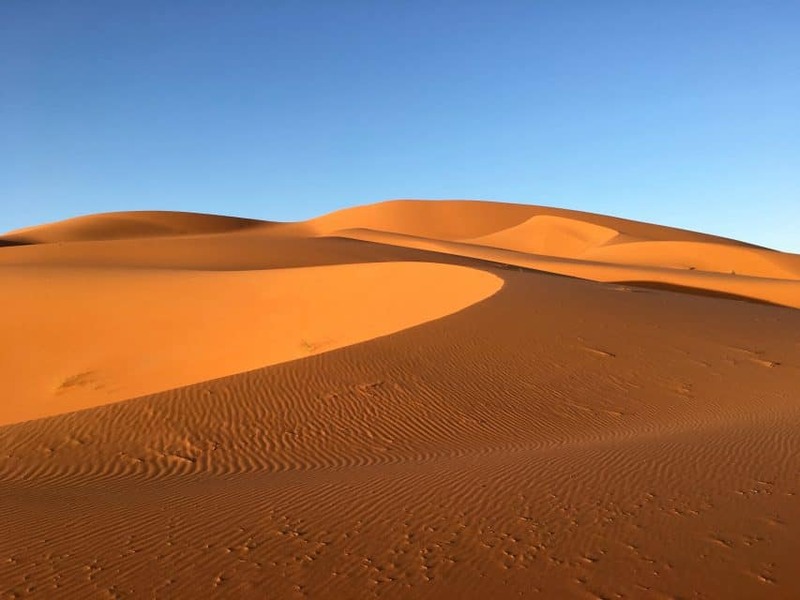 The main point of interest in the Sahara in Morrocco is without a doubt Erg Chebbi, a large sea of dunes formed by wind-blown sands just outside of the village of Merzouga. To visit this natural wonder, you should plan your Morocco desert tour through stops in either Marrakesh or Fez, the closest major cities to the sand formation. City highlights, points of interest en-route as well as a guide on Merzouga and its activities are gathered here and you should review a little bit before you begin on your Morocco excursion. Morocco is a land of rich culture and history. It is a place where nomadic peoples once came from the desert to erect beautiful, intricate architecture, excel in economy-boosting trade, and lay the foundation for education across the region for the past millennia. 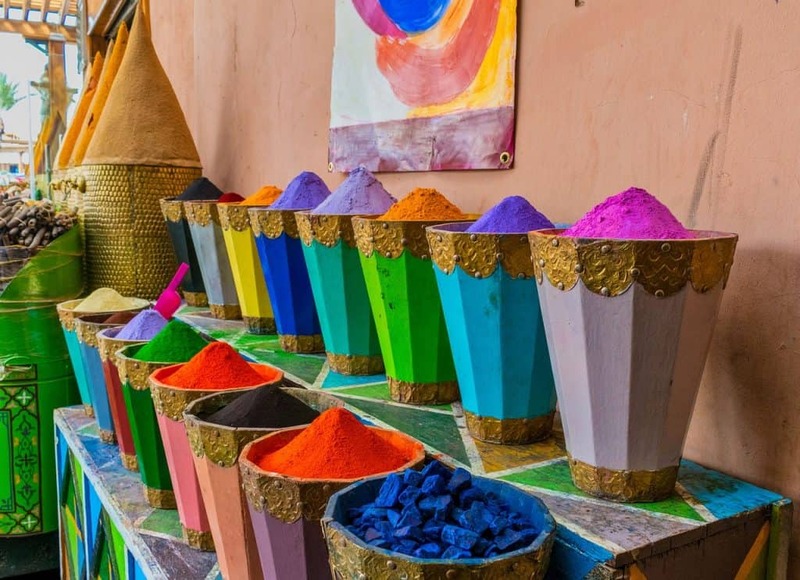 Both Marrakesh and Fez offer up proof of the advancements of ancient Moroccan society where educators and businessmen alike flock to its confines in order to make something of themselves. 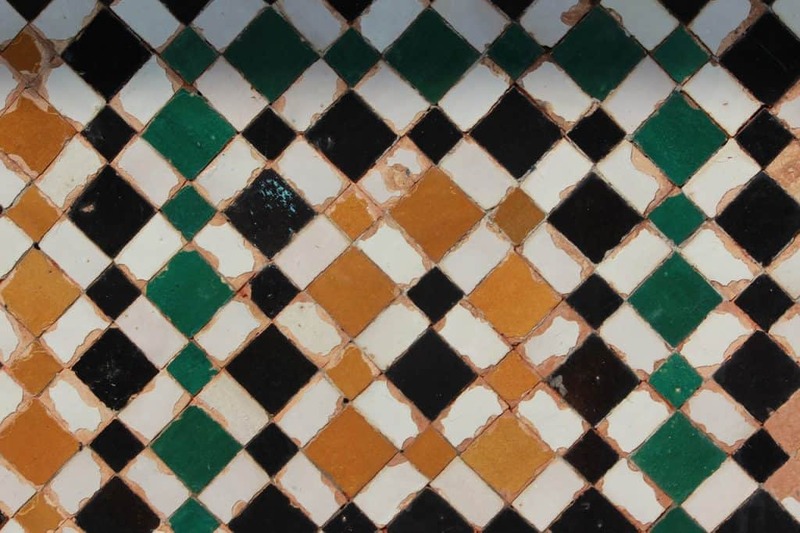 Both cities are testaments to the cultural advancements that Morocco achieved before the modern era. What’s more is that both are the closet pit stops for you on your Morocco desert tour. Fez is the closer of the two Moroccan cities to plan your desert tour with only a seven-hour drive south to the town limits of Merzouga. Fez is the second largest and one of the oldest cities in Morocco with a population of 1.1 million as of 2014. Because of the growing population, the city is a mixture of old and new with modern suburbs surrounding the “old city” section also known as the Fez el Bali. These old sections of the city and their contents are the reason why Fez has gained international recognition by environmental groups. The neighborhood is a walled area characterized by narrow, maze-like streets. This area is believed to be the world’s largest car-free zone which helped it gain UNESCO World Heritage Site honors in 1981. Within the Fez el Bali, almost a thousand years of trade and education are hidden in the maze of shops and homes. The University of Al Quaraouiyine (UAQ) is the oldest continually operating university in the world which opened in 859 AD. Inside is the oldest library in the Arab world with documents dating back to the same time period. Taking a few moments to appreciate these two milestones in education is highly recommended as UAQ paved the way for Arabian scholars for centuries. 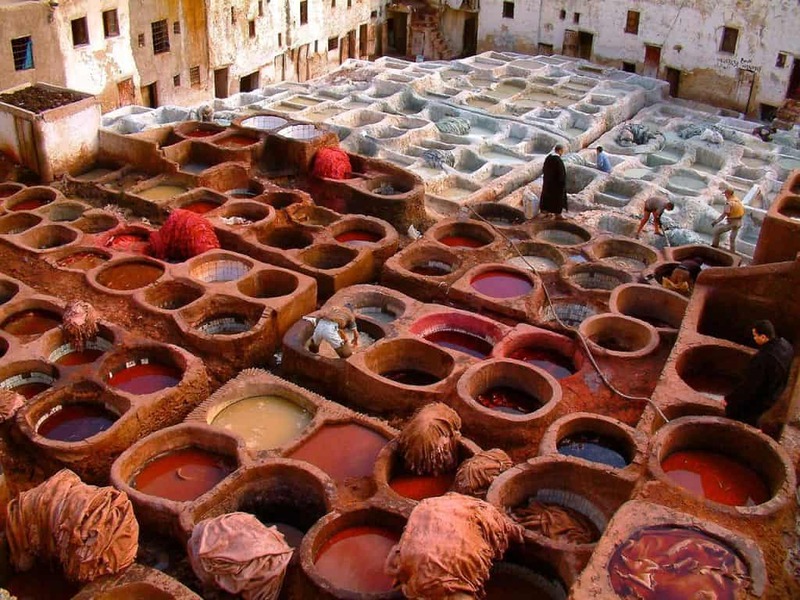 A ten-minute walk from the university and you will come upon the Chouara Tannery, Fez’s main cloth-tanning business that dates back to the 11th century. The cloth and hide tanning industry is alive and well in Fez where its exact methods have been in practice since the medieval era. Numerous stone holes are filled with various liquids and other materials to dye the hides of animals in order to sell them as clothing and purses. But do not worry if you cannot find the path to the Chouara Tannery by sight through the maze of streets. You will definitely be able to smell your way there. Besides the quicklime and saltwater used to break down the leather, it is customary to use cow urine and pigeon excrement as well. The acidic nature allows the hides to become malleable and although it may seem unusual to use these substances, the final product is proven in its quality as the Chouara Tannery is one of the city’s main tourist attractions. 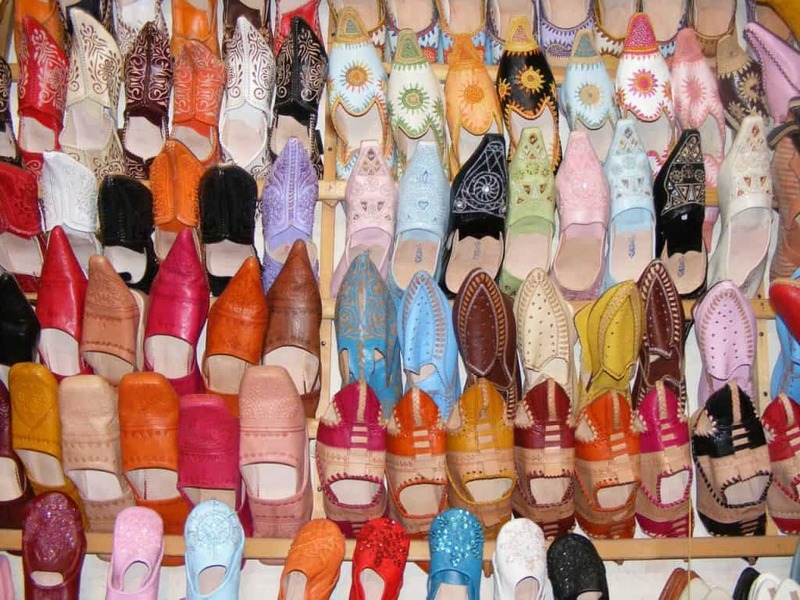 Marrakesh, although the more famous of the two, is further from Merzouga than Fez. Your desert tour trip from here to Merzouga is about nine hours east by car. Although it is a longer drive than Fez, this city is one of the most lively on the African continent thanks to its growing tourism industry. The relatively recent surge in real estate and hotel development in the city has seen a rise in popularity with travelers from all over the world, especially those from France. Like with Fez, the old quarter of the city is a UNESCO World Heritage Site given its lack of cars in its narrow, maze-like streets. Included in the medina is the Jemaa el-Fnaa which serves as the city’s main shopping area, one of the busiest in Africa. In what has been called, “a bridge between the past and the present,” Jemaa el-Fnaa houses monkey trainers, snake charmers, mystics, musicians, herb sellers and much more in the 1000 hectare main square. Other attractions for you to see before embarking on your Morocco desert tour are the numerous palaces and riads (Moroccan mansions) located in the city. Although many are privately owned, there are a number of grand, architecturally distinctive buildings in Marrakesh still worth visiting. The Bahia and El Badi Palaces are the most popular, both of which contain massive gardens and classic Moorish architecture. The Bahia Palace finished construction in the late 19th century while the El Badi Palace was completed in 1578 following the Moroccan Saadi dynasty’s victory over the Portuguese in the Battle of the Three Kings. From Marrakesh (nine hours) or Fez (seven hours), the road to Merzouga is a windy road through a sandy, rocky landscape where you will most likely take a quick jeep ride for the final leg. Along the way, you will pass by many nomadic villages and oasis towns that offer themselves as a quick stop to stretch your legs before continuing on. However, you should not stay in the car the entire way as desert oases can be spotted along the road intermittently. The striking visual change in environment is to be noted and leaving to explore the date palm forests is highly recommended. In addition to the desert oases, the region is rich in its geological history with a number of fossils from ancient oceans available for purchase. The oasis town of Erfoud is particularly known for its large collection of fossils of ammonites, trilobites, and orthoceras, an ancestor of the modern-day squid. Only 33 miles (54 km) northwest of Merzouga, this town’s fossils are incorporated into elegant table and fountain designs and is a great place to help gain a better understanding of the contrasting ocean landscape of the region from millions of years ago. Now that you have arrived in Merzouga, you will notice Erg Chebbi of the Sahara to your left with the quaint little village on your right. 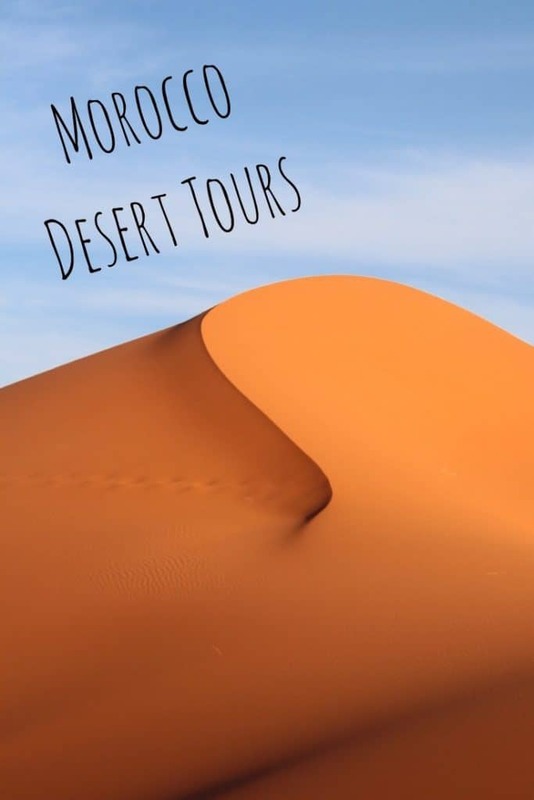 Depending on the Morocco desert tour company you signed up with, you will either stay in town in one of its many hotels or you will rough it and stay in a desert camp just outside of town. If you chose the latter do not worry, modern toilets are available via water trucks from the village. When I went on my desert excursion, my group and I booked with Riad Nezha and stayed in one of the nearby desert camps. The people of Merzouga and their culture is much different from what you see in the cities of Morocco. The people of this region are Berber, an ethnic group indigenous to North Africa in which at least 40 percent of its people live in Morocco. The Berbers that I met in Merzouga were very welcoming, with offers of traditional meals and live music performances while staying in their desert camp. One interesting aspect of Berber culture that I found very interesting was their sand healing remedies for rheumatism. During the hottest months of the year, locals flock to Erg Chebbi from all over Morocco to be buried up to the neck in sand for minutes at a time. The practice is considered to be a treatment for chronic pain of joints and connective tissues. I planned my Morocco desert excursion in mid-October and so could not participate, unfortunately. There are a number of things in and around Merzouga that you can do to occupy your time. 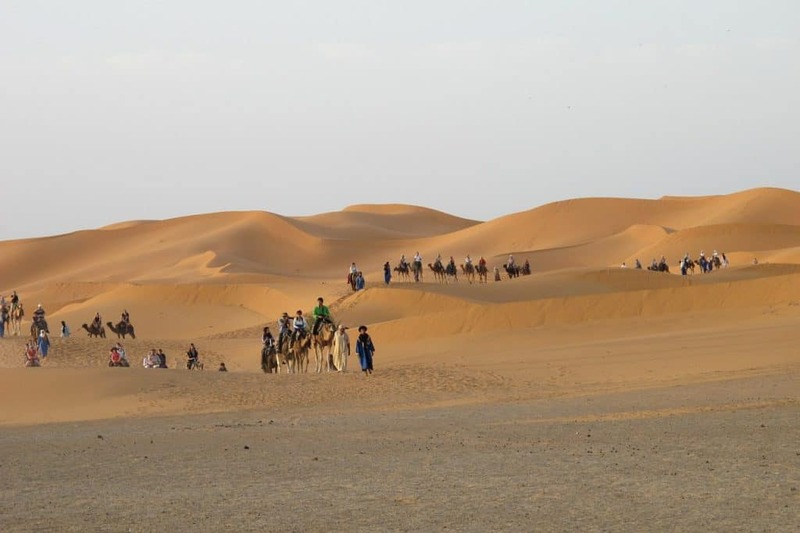 The most popular activity on these Morocco desert tours is always the camel riding excursion which can be organized through your tour company. Riad Nezha helped organize our camel riding experience which took us through the Saharan dunes and into town where we were able to relax poolside after the fact. Besides that, renting ATVs and modified snowboards are a few of your other options. If you are more interested in renting ATVs, consider planning your Morocco desert excursion for the beginning of October as it coincides with the annual Merzouga Rally, a rally car race across the desert landscape. Although professionals from around the world travel to Merzouga for this five-day race, amateurs are welcome to participate in lower level competitions. Renting either the ATVs or snowboards can result in some fun daytime activities but I personally recommend sandboarding. Few places on Earth have dunes large enough to support such an activity which truly makes it a once-in-a-lifetime experience. Fair warning though, the slopes are steep and it is very difficult to carve a pathway going down but my single intention of going to Erg Chebbi was to ride its tallest dune to the bottom and nothing was going to stop me; not even a nasty fall or two. As amazing the site during the day, the view of the dunes does not compare to the views of the stars at night. With little to no light pollution, the Saharan sky is full of stars in all directions. You can see everything so clearly to the point that the Milky Way can be seen as a grayish discoloration across the sky. This was certainly a highlight of my Morocco desert tour. It was a very special moment for me and I hope everyone can have a similar experience in their lives. All in all, Morocco is a wondrous place with a lot of culture and history just underneath its sandy surface. The country is one full of potential adventures to be discovered. From its big, robust cities to its remote desert oases, Morocco has something for everyone. I chose to embark on a Moroccan excursion to the Sahara and it lived up to my already high expectations. Erg Chebbi seemed like an ocean of sand but it was only a small portion of the vast desert that stretches across North Africa. Lifelong memories can be had in the desert surrounding Merzouga. It is the perfect place for those of you who are looking to have an unconventional yet mind-blowing experience on your next vacation. Diego Maloney has traveled to 27 countries in his short 23 years. He has lived in 4 countries on three continents (Chile, Jamaica, Spain and the United States). He has the heart of an adventurer having run with the bulls in Pamplona, sandboarded in the Sahara Desert, hiked Machu Picchu and scuba dived with sharks in the Caribbean. He loves football (soccer) and geopolitics and hopes to make a career out of these passions in the form of global security for events like the FIFA World Cup. You got a nice write up there. I wish I’d had the chance to visit the Sahara Desert. Added it to my itinerary, may actually go there soon.